R. D. Kardon’s debut novel puts you in the cockpit with Tris Miles as she navigates the challenges of integrating an all-male corporate flight department in 1997. Tris encounters harassment, marginalization, and backstabbing on her journey to becoming a jet captain. Robin “R.D.” Kardon was a litigation attorney before beginning a twelve-year flying career as a corporate and airline pilot. She holds an Airline Transport Pilot certificate and three Captain qualifications. Her travels took her all over the world in every type of airplane from small single-engine Cessnas to the Boeing 737. Robin earned her B.A. in Journalism and Sociology from NYU and J.D. from American University, Washington College of Law. A native New Yorker, Robin now lives in San Diego, California with her beloved rescue pets. 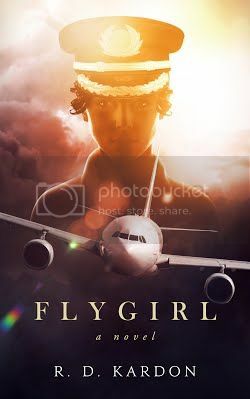 , a work of fiction inspired by her own aviation experience, is her first novel. Flying is a series of small corrections Tris nudged the yoke to bank the airplane left, the plastic coated steering column cool beneath her hands. She thought of all the ways pilots measure movement: degrees of heading, feet of altitude, ticks of the clock. Always counting up, down, until the next critical moment. As Clear Sky 251 slid toward the ground, Tris counted down. I love a story about a hard charging persevering woman who attains her goals. This is an inspiring story and I think many women of all ages can find encouragement. Thanks for sharing.